I’ve only just received the new Painted Harvest Bundle, so I haven’t had a chance to use it yet. If you haven’t seen it, (where have you been hiding!?) it’s the gorgeous stamp set that looks like a sunflower. It’s a 2-step stamp, which means that you can create gorgeous multi-coloured flowers and leaf images. Anyway, since I didn’t have this set when I had my Holiday Catalogue Celebration a couple of weeks ago, I created my own version of an unusual sunflower! I’d call it punch art, but no punches were used in the creation of this card! 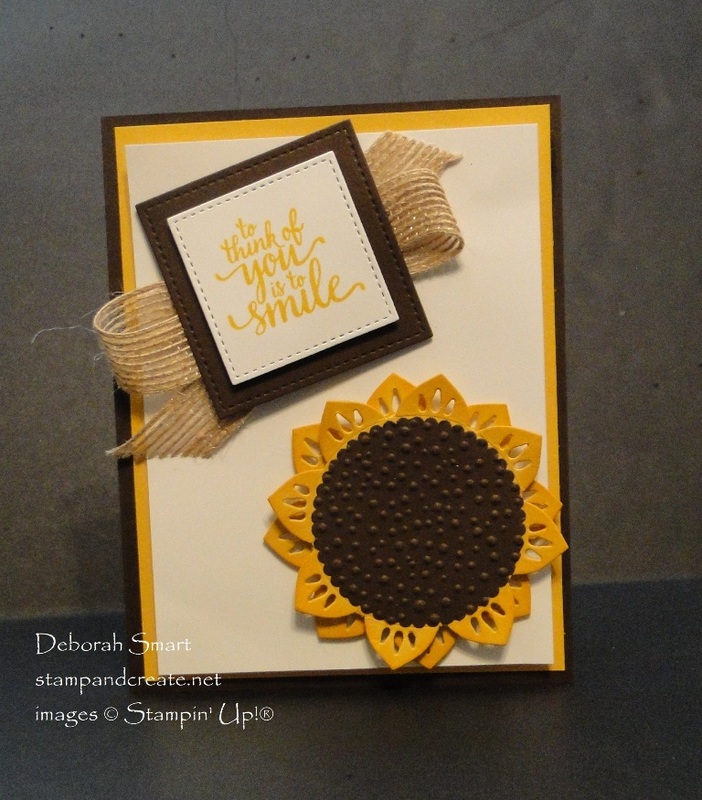 🙂 The sunflower was actually created using the Eastern Medallions Thinlits Dies, the Layering Circles Dies, and the Gently Falling Embossing Folder! When you run it through the Big Shot, the petals will actually be ‘attached’ to the outside cardstock frame; just take your Paper Snips to release the petals from the cardstock. You’ll be left with the petals connected by the inside ring. I used Crushed Curry cardstock for the petals, and Chocolate Chip cardstock for the centre of the flower. Creating the centre is easy; die cut the Soft Suede cardstock with the scalloped Layering Circles Framelit that fits the inside, just overlapping the petals to hold in place. After die cutting the scalloped circle, run it through the Big Shot again, this time with the Gently Falling Embossing Folder. Place the cardstock near the part of the folder where the dots are heaviest, so they look like the ‘seeds’ of the sunflower’s middle. The sentiment is from the Eastern Beauty stamp set (you can Bundle the stamp set and thinlits, and Save 10%! ), stamped in Crushed Curry ink onto Whisper White cardstock. Use the Stitched Shapes Framelits to die cut the sentiment, and the Chocolate Chip cardstock square behind it. Once you have all your pieces ready, it’s time to start building your card! The card base is Chocolate Chip cardstock measuring 8 1/2″ x 5 1/2″, scored and folded in half at 4 1/4″. Next, add a 4″ x 5 1/4″ panel of Crushed Curry cardstock, then a 3 3/4″ x 5″ panel of Whisper White. Use Stampin’ Dimensionals to attach the sentiment to the Chocolate Chip square, then attach it a length of Burlap Ribbon behind it. Attach it to the card front using more Dimensionals. To create your sunflower, first use a Sponge Dauber and Crushed Curry ink pad to sponge some ink to the edges of the flower petals. Then glue the layers of petals, offsetting them so all of the petals show. Finally, add the centre of the flower with Dimensionals, and add the flower to the bottom right corner of the card front. To order the supplies I used to make this card, click on the images below. That will take you directly to my online store, where you can order at any time. Thanks for spending some time with me today! I hope I’ve inspired you to be creative with your supplies 🙂 Be sure to come back again, as I’ll be creating with the new Painted Harvest Bundle soon! Next Next post: NEW CLASSES ADDED-SIGN UP NOW! 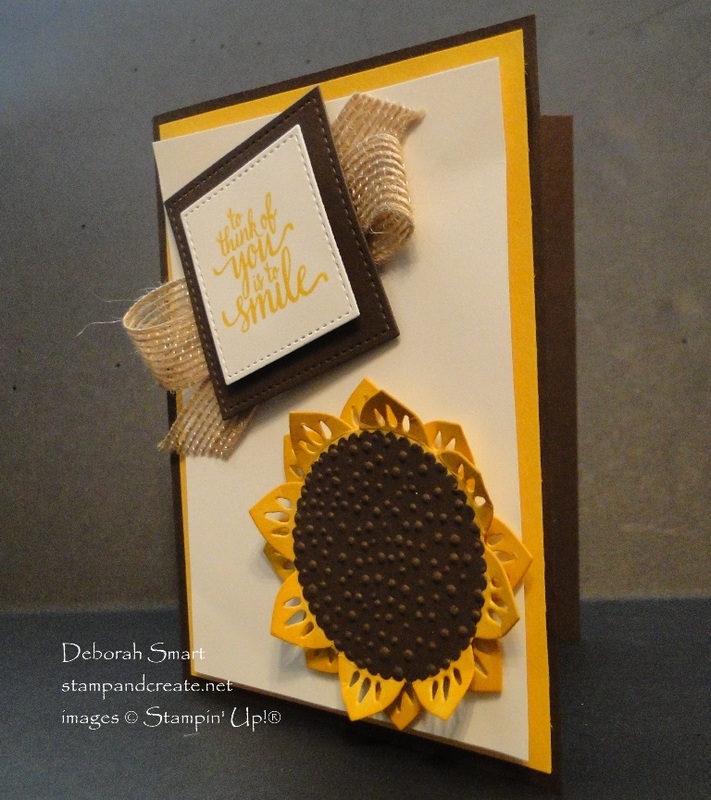 Very creative sunflower, Deborah. Great card, and thanks for the instructions. I’m glad you like my sunflower, Buffy! 🙂 It was fun to make. I love your “unusual” sunflower. It is beautiful. I also love what you did with your ribbon!